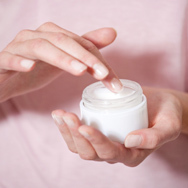 If you’re spending money on skin care products that come in jars, you’re doing your skin a major disservice, especially when buying anti-aging products. We reveal what the research has to say about this topic and share the kinds of effective skin care packaging required for maximum benefit. Research makes it clear that many of the best ingredients for skin—including antioxidants and anti-aging champions like vitamin C and retinol—break down in the presence of air. Essentially, opening a jar* lets air in, causing these important ingredients to begin deteriorating, becoming less and less effective with each use. Making matters worse, see-through glass jars (or clear bottles or tubes) allow routine exposure to daylight, further compromising the efficacy of these types of ingredients. There’s also the hygiene issue: Every time you dip your fingers into the jar, you contaminate the formula—even if you wash your hands first or use the “special” spatula that accompanies some jar-packaged products. It’s simply impossible to keep the tools and your fingers completely clean. This hygiene issue stresses the preservative system, leading to further deterioration of the beneficial ingredients. * Airless jars (the kind where you press the top down to dispense product without opening the jar) are the exception to this rule because they restrict air flow and help keep the delicate ingredients stable. Smart skin care packaging is a cornerstone of Paula’s Choice. From airless pumps, multi-layer tubes, opaque bottles, to UV-protected containers and air-restrictive openings, we make sure our complex formulas stay as potent and effective as possible. Our CLINICAL 1% Retinol Treatment uses a double-walled opaque container and is filled via a unique stabilizing process, allowing for next-to-zero exposure to oxygen. Our RESIST Triple Action Dark Spot Erasers are packaged in special flexible tubes coated with multiple layers of air-blocking materials to keep the active ingredient (hydroquinone) effective from first to last use. Our C15 Super Booster contains a special internal stopper that prevents air from being pushed back into the bottle when you replace the dropper applicator. The key takeaway: Minimizing air and light maximizes your skin care benefits. You might wonder—if all of this is true, then why do companies continue to sell expensive skin care creams in jars? Trust us, we’re just as frustrated by this as you are. It’s not like the research on jar packaging is locked and hidden away somewhere—it’s been around for years and is undeniably known among cosmetic chemists. Regardless of these research-based facts about jar packaging, there remains a certain air of prestige tied to fancy, weighty jars, and many consumers still prefer them. That’s why so many brands continue to use them and why people continue to buy them. Another factor is that it’s sometimes easier or less expensive for a company to put their formulas in jars; so, in essence, they’re taking a shortcut that shortchanges your skin. State-of-the-art, stability-proof packaging may cost more behind the scenes, but it’s vital if the formula is to work as effectively as it possibly can for your skin.